T-Mobile's been stirring the pot in recent months, launching an ambitious "Un-carrier" initiative and touting its new unsubsidized strategy. Contrary to popular belief, T-Mobile hasn't been able to quit subsidies quite yet (they are rather addictive, after all). The magenta carrier has axed service contracts, but is still offering to foot part of the device bill, even if it's not being entirely forthright about it. I noted the discrepancy between Apple's retail pricing and T-Mobile's installment plan totals when the device was announced last month, but now investors have more evidence regarding the arrangement. 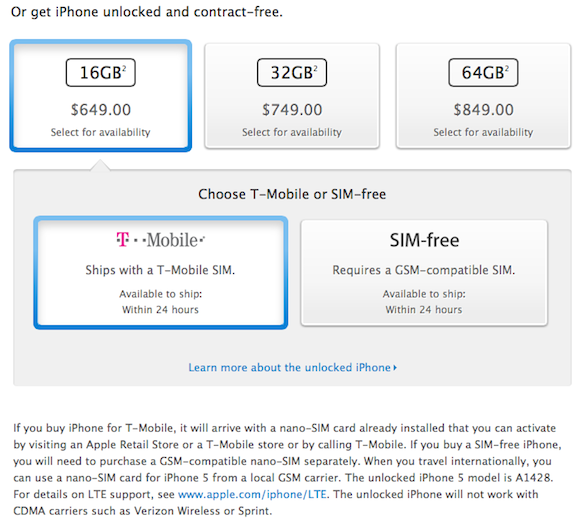 For starters, Apple now sells T-Mobile iPhones through its own online store, and they're unlocked and contract-free. These models are sold at full retail pricing of $649 to $849. Unlocked iPhone buyers can choose to have a T-Mobile SIM pre-installed or get one SIM-free. It makes no difference to Apple. If you mosey on over to T-Mobile's online storefront and compare full device cost, there's exactly a $69 difference between its prices and Apple's prices. Sources: Apple and T-Mobile. iPhone 5 pricing shown. That missing money has to be coming from somewhere. There are exactly two candidates for who's covering the difference. Hint: It's not Apple. It's not as if T-Mobile is giving away the $69 for nothing. The vast majority of consumers will opt for the installment plan, and those devices will be locked to T-Mobile's network while you're still on the hook for 24 monthly payments. The carrier will unlock the device for you once it's paid off and you can call it your own. For $69, T-Mobile still has a good shot of getting two years of loyalty, just not through a service contract. In theory, a customer could go purchase an iPhone from T-Mobile at full price for $580 and have them unlock it immediately and then go use the savings to buy an Apple Wireless Keyboard, but T-Mobile is playing the odds and hoping very few people care enough to do this. BTIG analyst Walter Piecyk also noticed this difference, and believes it's a "promotional subsidy within T-Mobile's new strategy." Furthermore, Piecyk believes the promotion will expire eventually and T-Mobile iPhones will go back up to full retail pricing, even if they're available on installment plans. T-Mobile actually isn't the only carrier to offer these types of promotions. Other prepaid carriers do the same. Leap Wireless' Cricket brand offers a $150 rebate, bringing the entry-level iPhone 5 down to $500. Cricket is also a prepaid carrier with no contracts, and Leap absolutely pays subsidies. On the most recent conference all, CFO R. Perley McBride noted that the company has made progress reducing subsidy costs, which were down $24 million sequentially in the fourth quarter. Leap still needs to ramp up iPhone selling efforts, since it's nowhere near on target for its iPhone purchase commitments. Sprint Nextel's prepaid Virgin Mobile subsidiary does the same thing. Virgin Mobile doesn't currently offer the newest iPhone 5, but pricing for the older iPhone 4 and iPhone 4S models implies a $100 promotional subsidy, again for a carrier with no contracts. Unlike Leap, Sprint actually appears to be ahead of schedule with its own iPhone obligations. To be fair, T-Mobile's new promotional subsidy strategy will translate into dramatically lower subsidy costs, and the risks that it faces of consumers taking advantage of the system are negligible, since most will pick the installment plans. The $69 promotional subsidy sure beats the estimated $425 subsidy that postpaid carriers send to Apple. No. 1 carrier Verizon Wireless is even now testing the installment waters, rolling out its own payment plans in response. Big Red's plans are for 12 months and truly full retail prices, which would result in higher monthly payments compared to T-Mobile's 24-month discounted price plans, but the top carrier is giving it a shot. While some may think T-Mobile's new strategy is a disruptive threat to the subsidy model, I still believe its brave new world isn't so brave. With Apple earnings coming up, there's a debate raging as to whether Apple remains a buy. The Motley Fool's senior technology analyst and managing bureau chief, Eric Bleeker, is prepared to fill you in on both reasons to buy and reasons to sell Apple, and what opportunities are left for the company (and your portfolio) going forward. To get instant access to his latest thinking on Apple, simply click here now. The article No, T-Mobile Has Not Killed iPhone Subsidies originally appeared on Fool.com.